Today it was hard to get out of bed when the alarm clock went off, even though I got around 8 hours of sleep. I was a little slow getting ready, but my Camino family was waiting for me downstairs. We set off together around 7:30. I was not in such a great mood in the morning and probably could have used another hour or two of sleep, but I couldn’t afford it this morning. Shortly after heading off, I realized that being in a grumpy mood was not going to make my day any better. I decided that I was not going to let a lack of sleep or the events from yesterday bother me. 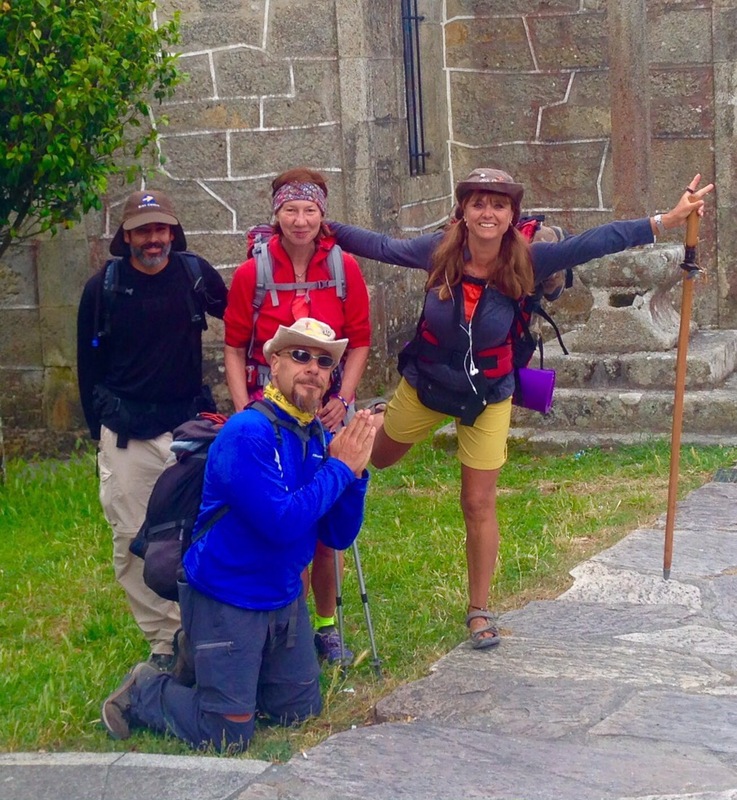 I was going to walk with a smile on my face and enjoy the last few days to Santiago. Shortly after making that decision, I was walking along the path and saw a fellow pilgrim sitting by the side of the road. As I got closer, he asked if I spoke English. I told him that I did, and he asked if I had 50 cents that I could give him for food because he was hungry. He looked weather beaten and tired. I told him that I was sorry and that I didn’t have any spare money and continued on my way. I got about ten steps away when I realized that I had some breakfast biscuits that I had for when I didn’t have a chance to get breakfast. I was out of his view but decided to open my pack and give him one of the packets. I walked back and said, “Sir, I don’t have any money that I can give you, but I do have this.” and handed a packet to him. He thanked me and proceeded to open the pack immediately. I felt good inside for the good deed, but also felt sorry for him and the state that he was in. I always feel bad when I pass a person asking for money, and I do not help them. But some times, there are simple gestures of kindness that you can do that make a huge difference in others lives. Sometimes all it will cost you is a smile. Since we stopped before the main stop, the trail was rather clear and much like the earlier stages of the Camino. We came across several pilgrims that we walked with before, and we also came across the man with the cell phone from yesterday. Today, he had a spring in his step, a smile on his face, and no cell phone in his hand. He had freed himself from the business of life, and was much happier for it. He thanked my friend again for her advice and continued along the Camino. The path today had a few steep inclines, but it wasn’t too difficult. We made several breaks along the way to get coffee in the morning, and a nice cold drink to escape from the hot sun. We made good time and arrived at our destination around 3:30 in the afternoon. We had walked only 13 miles but had planned it that way. We had a reservation set up for four at the Albergue. We were given a room for four, so we don’t have to be in the big communal room. We had some time to relax and clean up before heading to dinner. We ate at a pulporia, which specializes in spicy octopus. It was delicious! Now, I am only about two days from arriving in Santiago. It is exciting and a little sad at the same time. Tomorrow, my Camino family will be parting ways. We had hoped to all arrive in Santiago together, but one of the Germans has been having some trouble with her ankle and only plans to walk 13km tomorrow (8 miles). The other German is anxious to arrive in Santiago and make her way home. My Italian brother and I plan to walk 25km (16.5 miles) tomorrow so that we can arrive in Santiago on Wednesday. It is definitely sad to see the end of this, but we all will be staying in Santiago for a few days and will meet up again for a nice dinner when we are there. It is not the end of our relationships, as we all plan to stay in touch even after it is all over. I still can’t believe that I have almost made it to Santiago.